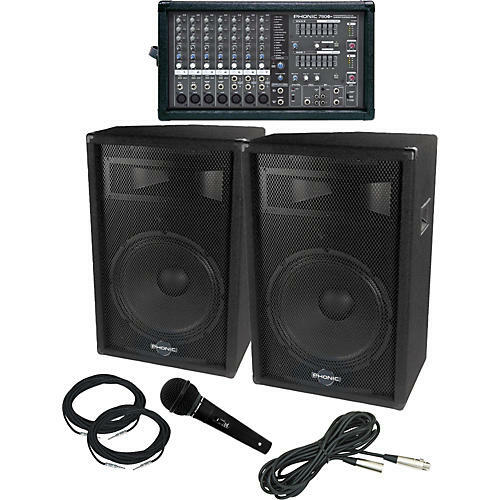 The Phonic Powerpod 780 / S715 PA Package includes a Powerpod 780 powered mixer and two S715 15" 2-way speakers. This is a great portable PA setup that delivers power, durability, and affordability. The mixer has 7 XLR inputs, making it have an ideal amount of inputs for miking drums. Includes 2 - 20' speaker cables and dynamic mic with cable. The Phonic Powerpod 780 Plus powered mixer is built into a compact and durable molded cabinet, and has a built-in 300W + 300W @ 4 ohm stereo amplifier which is patchable. Two super Hi-Z inputs optimized for direct instrument input allows for the addition of guitars and other instruments. This mixer features an onboard digital effects processor with 32 - 40-bit digital effects with 16 preset programs plus a parameter control for each effect's main parameter, as well as a footswitch jack. It also has 7 balanced mic inputs, 3-band EQ on every channel, and a dual 7-band graphic EQs with selectable In/Out switches, giving you extensive control over your mix. The Phonic S715 15" 2-way Stage Speakers have 400W program, and 600W peak power handling. They incorporate 15" heavy-duty woofers, with piezo tweeters. These speakers have a built-in handle, and a 35mm stand adaptor built-in as well. They also have dual 1/4" phone jacks, and can be used as floor monitors or mounted main speakers. Includes a dynamic mic and all cables. Speaker Outputs: 5 TRS 1/4"